With a large segment of the “baby boomer” generation beginning to look at the possibility of retiring, many of these individuals are envisioning what their lives will look like in retirement. Many people are looking at their homes and thinking whether now may be a good time to look at some renovations to improve the usability of certain areas of the home, as well beginning to think about accessibility issues that could become problems down the road. At Prince & Sons, Inc., we recently were brought on by a local family looking to renovate an old farmhouse to add modern conveniences in terms of a more open floor plan, renovating the kitchen and offering guidance and assistance in regards to potential accessibility concerns down the road. When we took on this project the first step was to update the electrical in the kitchen to bring it up to code. We then began removing all of the cabinets to create an improved kitchen layout between the kitchen and downstairs living area. While accessibility is not currently a concern, we’re configuring the cabinets in such a way that a walker or wheelchair could easily be maneuvered throughout the new space. One of the main reasons to hire a general contractor like Prince & Sons is the level of expertise that we are able to bring to a home remodeling project. When we were first looking at this project we noticed that there was a 5/8 inch height difference between the floor in the dining room and kitchen. This height difference was a trip hazard and is something we’re resolving in this home renovation. 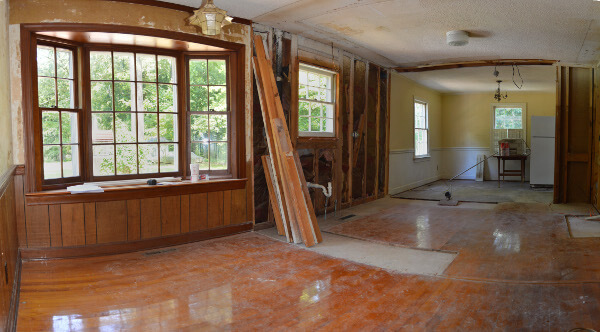 Because this home is an old farmhouse we were wanting to save the old hardwood floor that we removed so that we could reuse the flooring after leveling the floor between the two rooms. We’re always focused on ways that we can maintain the historical character of homes that were built many years ago. In talking with the homeowner and family it was also decided to add an additional entry door in the rear of the kitchen for easy access to the backyard. Down the road if a ramp were ever needed, it could easily be constructed at the rear entrance of the home. When constructing handicap ramps, it’s always a good idea to build them so that they are not seen from the street in order to prevent the possibility of being targeted by criminals. While a handicap ramp may never be needed, it’s important when completing a full home renovation to keep these things in mind, just in case the need arises down the road. It’s much easier to make certain considerations such as this now, so that in the future, constructing these additional handicap accessibility features will be much easier. At Prince & Sons, Inc. we’re proud of our work on this project and we’re excited to see the finished product in the next few weeks. This is actually a long time client of ours and we’re honored that the family chose us to complete another home renovation project for them. If you’d like more information about our wide range of renovation and home remodeling services don’t hesitate to contact us today at (919) 383-0888. © 2019 Prince & Sons, Inc.